Computer mice existed long before the Mac, and most of the old 8-bit computers had some software that could use a mouse. These mice had balls and quadrature encoders. While converters to turn these old mice into USB devices exist, going the other way isn’t so common. [Simon] has developed the answer to that problem in the form of SmallyMouse2. It turns a USB mouse into something that can be used with the BBC Micro, Acorn Master, Acorn Archimedes, Amiga, Atari ST and more. The design of the SmallyMouse2 uses an AT90USB microcontroller that supports USB device and host mode, and allows for a few GPIOs. This microcontroller effectively converts a USB mouse into a BBC Micro user port AMX mouse, generic quadrature mouse, and a 10-pin expansion header. The firmware uses the LUFA USB stack, a common choice for these weird USB to retrocomputer projects. The project is completely Open Source, and all the files to replicate this project from the KiCad project to the firmware are available on [Simon]’s GitHub. If you have one of these classic retrocomputers sitting in your attic, it might be a good time to check if you still have the mouse. If not, this is the perfect project to delve into to the classic GUIs of yesteryear. Much like using UV light to erase data from an EPROM, researchers from UC Davis have used light to erase specific memories in mice. [Kazumasa Tanaka, Brian Wiltgen and colleagues] used optogenetic techniques to test current ideas about memory retrieval. Optogenetics has been featured on Hackaday before. It is the use of light to control specific neurons (nerve cells) that have been genetically sensitized to light. By doing so, the effects can be seen in real-time. For their research, [Kazumasa Tanaka, Brian Wiltgen and colleagues] created genetically altered mice whose activated neurons expressed GFP, a protein that fluoresces green. This allowed neurons to be easily located and track which ones responded to learning and memory stimuli. The neurons produced an additional protein that made it possible to “switch them off” in response to light. This enabled the researchers to determine which specific neurons are involved in the learning and memory pathways as well as study the behavior of the mouse when certain neurons were active or not. Animal lovers may want to refrain from the following paragraph. 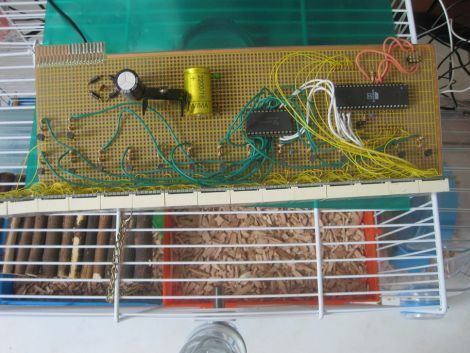 The mice were subjected to mild electric shocks after being placed in a cage. They were trained so that when they were put in the cage again, they remembered the previous shock and would freeze in fear. However, when specific neurons in the hippocampus (a structure in the brain) were exposed to light transmitted through fiber optics (likely through a hole in each mouse’s skull), the mice happily scampered around the cage, no memory of the earlier shock to terrify them. The neurons that stored the memory of the shock had been “turned off” after the light exposure. [VintagePC] pulled this old stereo out of a barn. It was in pretty shabby shape, but he managed get it running again and make it look great as well. While it had been protected from the elements, it had not been protected from the rodents. Mice had chewed their way through the fiberboard backing and made a nice home inside. He mentions that they chewed the string which operates the tuning dial, and we’re sure they were the cause of other problems as well. He gives the wise advice of not powering on an old set like this until you have a chance to assess the situation. The insides of the amplifier were about as disorderly as the last radio repair we looked at. But after carefully working his way through the circuits, replacing capacitors and resistors as needed, he started to make some progress. The receiver coil needed to be rewound and he used wire from an old CRT monitor for this purpose. The loop antenna was remounted and the record player arm was given a new cartridge and balanced using a clever LEGO apparatus. 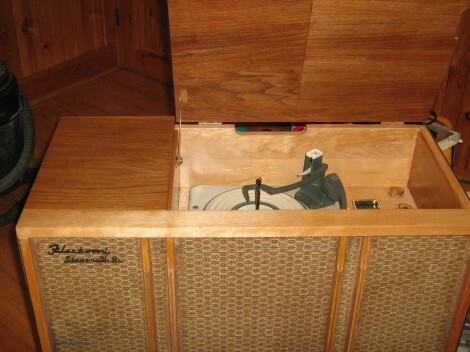 Some veneer work and wood finishing brought the case itself back to its original beauty. We’d say the hard work was well worth it. He’s got a big piece of furniture he can always be proud of! [Stephen’s] daughter has a pair of mice she keeps as pets, who happen to be quite active at night. After they kept her awake for an entire evening by running like mad in their treadmill, they were moved from her bedroom. Since they were so active in the treadmill, [Stephen] thought it would be cool to try measuring how much the mice actually ran each night. To keep track of their activity, he built a simple circuit that records how many rotations the treadmill makes. He fitted it with a rare earth magnet, installing a reed switch on the outside of case that ticks off each spin of the wheel. Any time the wheel starts moving, his PIC begins counting the rotations, displaying them on a 7-segment LED display. To mitigate data loss in the event of a power outage, the PIC stores the current number of rotations in its EEPROM every 10 seconds or so. The counter keeps track of the total number of rounds the mice have completed, which his daughter uses to manually calculate their running sessions. Since they started tracking the mice, they have run over 700,000 rounds, sometimes completing as many as 20,000 in an evening. We think it’s a pretty cool project, especially since it makes it fun for his daughter to stay involved in her pets’ lives.